If you enjoy ice skating, or if you’d like to try it, there are many ice rinks to choose from during the winter months. Each year from around November onwards an array of temporary festive ice rinks pop up in locations across the city. Outside the Christmas period, there are also several indoor permanent ice rinks where you can get your skates on all year round. Here’s the lowdown on the top places to ice skate in London. If you go, be sure to book in advance, as sessions do sell out. Set in the vast enclosed courtyard of this palatial Georgian building, the Somerset House rink covers 900 square metres and is a joy to skate on. A 40-foot high Fortnum and Mason Christmas tree stands sentinel next to the rink and there’s a separate children’s area with polar bear skate mates to help young skaters to find their balance on the ice. You can warm up at the cosy Skate Lounge cafe and bar area, which is next to the rink. 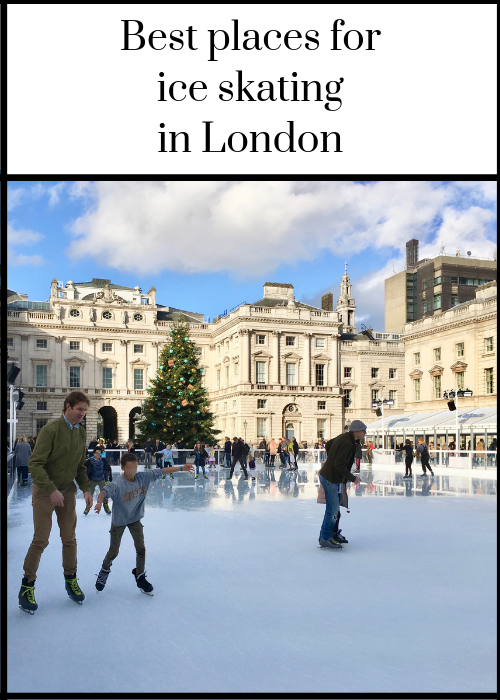 Read my full review here: Ice skating at Somerset House. 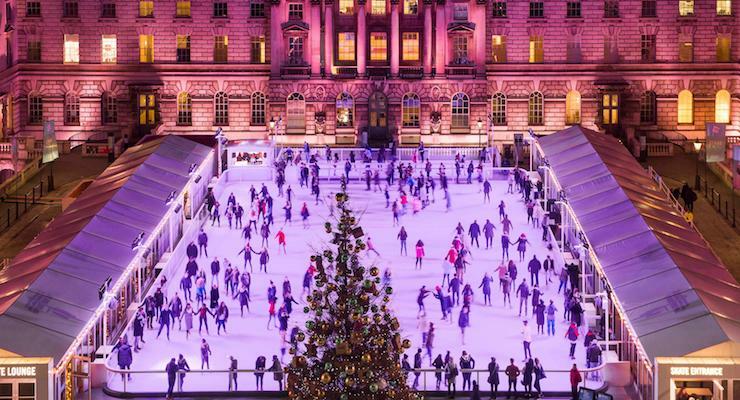 Skate at Somerset House is open until 13th January, 2019. The popular Natural History Museum ice rink is in the museum courtyard. The museum building is a work of art with spires and arches and stone carvings inspired by nature. A 30-foot Christmas tree twinkles in the middle of the rink, and there’s a cafe bar for hot chocolate afterwards. Entrance to the museum is free. The Natural History Museum ice rink is open until 20th January, 2019. 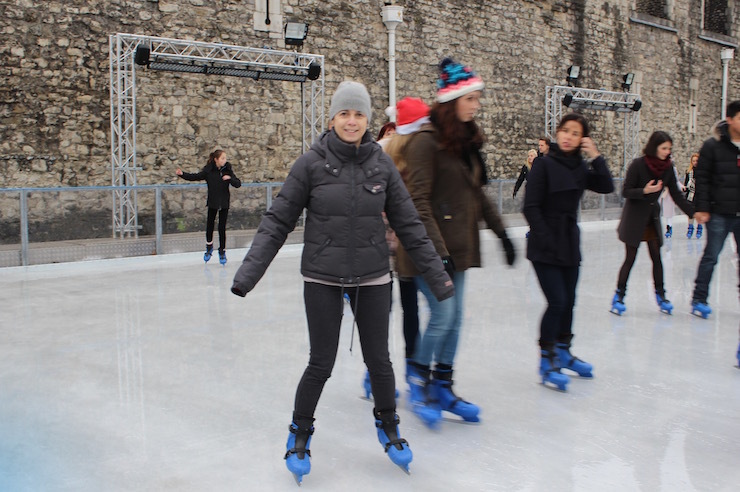 The Tower of London ice rink sits beneath the walls of the historic landmark, in the dry moat, with views of the River Thames. When we went (during the day) it was less busy than some of the other rinks, and I really enjoyed skating there. There’s a cafe next to the ice rink. The Tower of London ice rink is open until 6th January, 2019. The ice rink at Canary Wharf is enormous – it covers 1200 square metres. As this is primarily a business district, the rink is generally less busy at weekends than it is during the week. Next to the rink there’s a viewing deck, The Grandstand Bar. The Canary Wharf ice rink is open until 16th February, 2019. Each winter a large area of Hyde Park becomes Winter Wonderland. The outdoor ice rink, which is said to be the UK’s largest, is set around the park’s Victorian bandstand. If you need some skating help, you can book an Ice Guide for your session. The attraction also offers live shows, fairground rides and a Christmas market. The Winter Wonderland ice rink is open until January 6th, 2019. 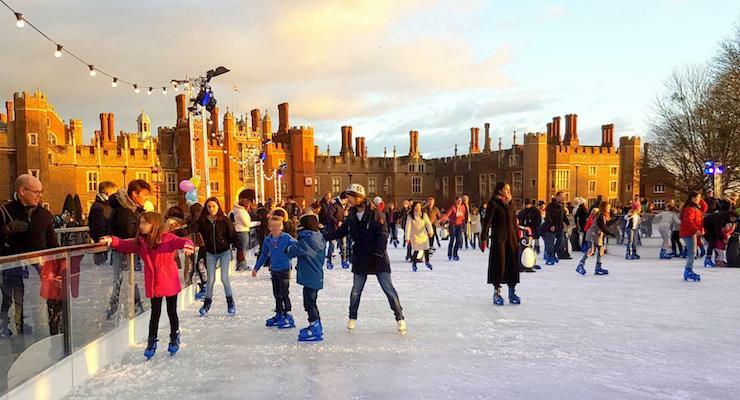 The Hampton Court Palace ice rink is open until 6th January, 2019. The Winterville Christmas experience at Clapham Common offers a 600 metre-square ice rink, as well as festive films, tasty street food, funfair rides, live music, Mexican wrestling, Plonk Golf and more. It sounds like a great place for a fun festive trip. The Winterville ice rink is open until December 23rd, 2018. Alexandra Palace started life as a Victorian recreation centre., and today it’s still a popular entertainment venue, and is known affectionally as Ally Pally. The indoor ice rink offers skating lessons as well as a festive winter programme, Ally Pally Winter Skate. Alexandra Palace ice rink is open all year round. There’s been an ice rink in Streatham since 1931, and the venue was completely renovated in 2013. With an area of 1800 square metres, the rink is the UK’s biggest, and offers skating lessons with professional coaches, as well as public sessions. Streatham Ice Arena is open all year round.